Seqonomics: Which is the best sequencer, ever? Which is the best sequencer, ever? 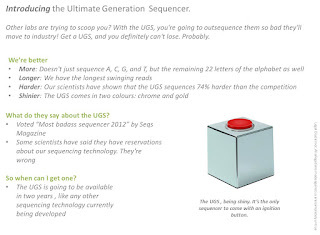 The Ultimate Generation Sequencer. Click on picture to enlarge. The UGS sequences so fast it'll travel backwards in time with your results. Chuck Norris will kiss each and every UGS unit before it ships. How can I pre-order the "UGS Gold Chuck Norris blessed" edition?